Adjunct is a term that means many things to many people. For those of you who don’t know, an adjunct (in beer terms) is basically anything added to the brewing process that isn’t malts, water, yeast or hops. These can include coriander, coffee beans, vanilla, and a variety of other additions to give a beer a unique taste. My first introduction to the term, however, had a negative connotation. American Adjunct Lager was my first experience with the term, and being a new, budding beer geek, I decided to look up the term and how it pertained to the beer around me. This bit of research brought to my attention the use of corn as an adjunct in many macro-brew. This addition is not meant to enhance flavour, but to stabilize it and take out some of the haze. In some cases with the larger macro lager producers, they will use a corn syrup as opposed to real corn as a cheaper alternative. New knowledge to the inexperienced can be a bad thing, however, and I denounced adjuncts, especially corn, quite vocally without really knowing what I was talking about. Over time, my perception on what an adjunct ACTUALLY was changed, and I was soon singing their praises. Corn was still carrying a negative meaning for me though until the Two Birds Taco once again changed my outlook. Last night, Tomahawk Bar hosted the first release of the aptly named Batch 001 from the “Band of Brewers”, a collaboration of 3 of Brisbane’s best brewers. My first thoughts when hearing that their maiden effort was to be an “American Corn Ale” included a fair bit of apprehension. An inkling of that old attitude towards corn was resurfacing. I did what I could to dispel it with the experience I had with Taco and the knowledge that brewers Ian Watson (Fortitude Brewing/Noisy Minor), Simeon Bonetti (Brewhouse Brisbane), and Mark Howes (Newstead Brewing) were heading the project. These guys produce some of the best beer in Queensland. Surely they wouldn’t let this experiment with corn turn into something reminiscent of Budweiser, would they? My worries were soon laid to rest. I arrived a bit early, grabbed a Batch 001 and sat with a few other beery people that happened to have arrived before I did. The beer itself had a nice light straw colour, but that’s where the similarities to AAL’s stopped. It had a smooth, sweetness to it, with a light, lingering corn flavour. At 4.5%, this is truly a sessionable beer and would do really well on a hot summer day by the pool. Clean, crisp, and flavourful. 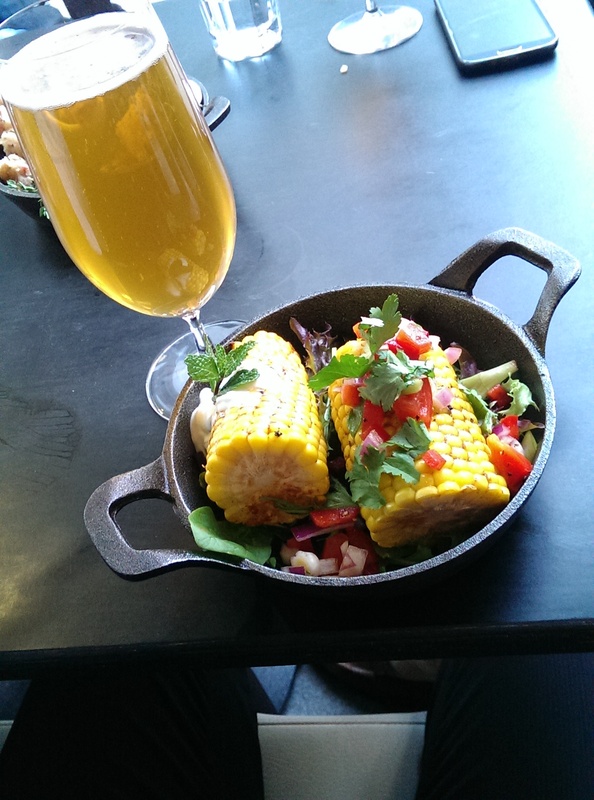 Corn on the Cob and Band of Brewers ‘Batch 001’. A corny combo. To keep the corn theme running, Tomahawk ran a special for $10, including a large glass of Batch 001 and corn on the cob done two ways. These were seasoned quite well, and it was a nice addition to a menu I normally find a bit too rich for my tastes. Mine was a bit cold when I finally tucked into it, but I place the blame fully on my incessant need to put everything up on social media, along with creating the beer on Untapped (this did have the added bonus of being the first to check it in, however). So, once again, my perception of beer has changed. Well done to the Band of Brewers for putting out a wonderful beer and I look forward to seeing what ingredient is used for Batch 002! You can follow Band of Brewers on their Facebook page or Instagram to keep an eye out for info on the next collaboration.